Idealism got a bad name somewhere along the way. Google on it and one of the definitions that pops up is “the practice of forming or pursuing ideals, especially unrealistically.” The psychologist Carl Jung called it as bad an addiction as narcotics and alcohol — “the tendency of high-minded people to avoid facing the reality of evil,” as one Jungian put it. True, it is difficult to remain idealistic in a world that produced Hitler, Pol Pot and ISIS. Idealism is less fashionable, less street-smart. There are advantages to cynicism. When we expect the worst, we are not disappointed when we get it. Cynicism is perverse evidence that a person must have standards, since he expects the world to fall short of them. But without idealism, we would not have the Declaration of Independence, the Bill of Rights or the U.S. Constitution. We would not have wedding vows, John Lennon songs, or a papal encyclical on stewardship of the environment. We would not have the United Nations Charter, the Earth Charter, the UN’s Millennium Development goals, or the UN’s sustainable development goals. We would dream too small, expect too little and chronically underachieve. A cynic probably would argue that all of the pronouncements of the world’s idealists – the declarations, treaties and charters — are not worth the paper they’re printed on, that their idealism is rarely justified, their hopes are seldom fulfilled and their plans usually are not accomplished. But can anyone argue credibly that a world without ideals and idealism would be a better place? Idealism invokes our better angels. It reminds us of what we would be if we were all that we could be. It is our collective conscience and the hope with which we survive divine discomfort. This all comes to mind because of a message from a good friend in Europe who has been involved in developing a Universal Declaration of the Rights of Humanity, a document commissioned by French President Francois Hollande. Hollande asked a former minister of environment in France, Corinne Lepage, to develop a statement for “a new stage in the field of human rights” for presentation at next month’s international climate conference in Paris. 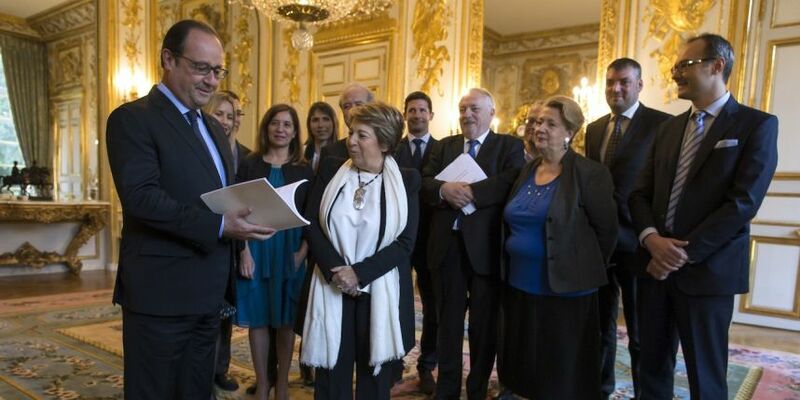 Corinne Lepage and her project team giving the Rights of Humankind Declaration Report to French President Francois Hollande. The result from Lepage and her team is not the first such declaration. It updates two others, both with their roots in crisis and in France. The first — the Declaration of the Rights of Man and of the Citizen — was inspired in part by the American Revolution, written for the French Revolution and approved in 1789 by France’s National Constituent Assembly. The second is the Universal Declaration of Human Rights adopted in Paris in 1948 by the UN General Assembly in the wake of World War II. The crisis that inspires the new Declaration is not a war against classes or between nations, but the war that mankind is waging against the Earth’s life support systems and the war that the generations alive today are waging against the generations yet to come. The human rights expressed in the new Declaration include the ability to live in healthy and ecologically sustainable environments and to preserve the natural resources that humanity holds in common. With these rights come obligations, the Declaration says, including the duty to respect the rights of others and of all living species; to serve as guarantors of ecological balance and our natural and cultural heritage; to ensure that scientific and technical progress work for rather than against the well-being of humans and other species; and to think about the long-term consequences of our short-term actions. The authors of the new Declaration definitely know “what the heck is really going on”. It was their knowledge and their determination not to turn away from it that demanded a new invocation of higher principles and ideals. Consistent with France’s tradition as the birthplace of these declarations, President Hollande intends to introduce the new document next month when more than 190 nations meet for the international climate conference in Paris. Hollande will ask the UN General Assembly to formally approve the Declaration next year. 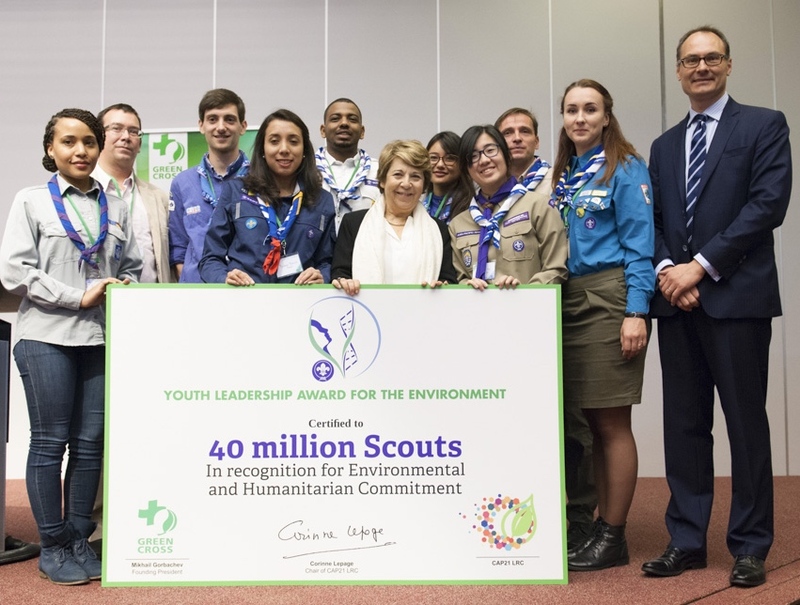 In the meantime, the Declaration’s ambassadors including some 40 million Scouts, will spread the word. Of what use is such a document? Only a cynic would ask. Readers can co-sign the Declaration at LINK. For more information, contact Adam Koniuszewski, who was a member of the Corinne Lepage project team, at adamkoniuszewski@me.com. The full project team includes: Ahmed ALAMI, Marie-Odile BERTELLA-GEOFFROY, Valérie CABANES, Francois DAMERVAL, Hubert DELZANGLES, Emilie GAILLARD, Christian HUGLO, Nicolas IMBERT, Adam KONIUSZEWSKI, Jean-Marc LAVIEILLE, Catherine LE BRIS, Bettina LAVILLE, Jérémy RIFKIN and Mathieu WEMAERE.